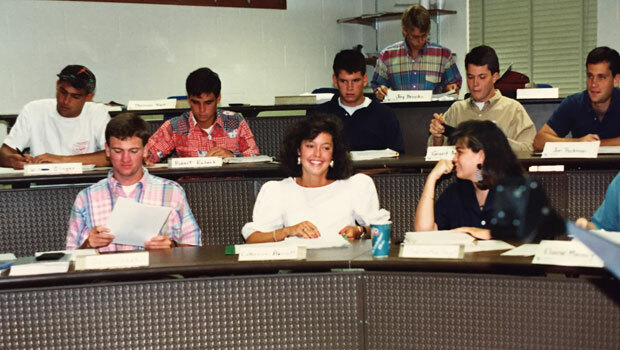 When the Summer Management Program (SMP) began in the summer of 1990, Wake Forest rising juniors and seniors wore big hair, big shoulder pads and big prints to class. Fast forward 25 years, and the program has grown exponentially, from one section of about 20 students in that first class to two sections less than five years later, to the current three sections of about 110 students. While students today are wearing different styles, what hasn’t changed is how integrative the program is run, with classes building on each other in an intensive five weeks. King says the classes build upon each other, so that what students learn in accounting also helps them as they study ratios in finance. The program not only teaches accounting, marketing, strategy and finance, but also business life skills, like communicating in business, managing up, and teamwork. Every day after class, students have two to three hours of team meetings to explore projects and other assignments. Over the years, the program has brought in guest speakers who live in the intersection of liberal arts and business. Two examples include L.A. Clippers point guard – and former Demon Deacon basketball star — Chris Paul, to talk about the intersection of business and athletics and “Father of the Bride” and “Buffy the Vampire Slayer” film producer Howard Rosenman, who offered his point of view about how business and entertainment connect. “The Summer Management Program was a great way for me to gain access to the business side of Wake Forest, and I’ve found that who I met and what I learned there has helped me to make my dreams a reality after graduation,” said Mo Earley (’13), who credits the program for changing her career trajectory. A sociology major, Earley attended the program the summer before her senior year. During the program, Wake Forest alumni from Deloitte came to give a presentation on consulting, and their passion for their jobs in federal consulting awakened something in her. “Deloitte Day revealed that consulting wasn’t an empty business term, but rather a way to use business knowledge to apply my liberal arts perspective. It became a very attractive option for making a positive impact on the world, and has continued to provide opportunities to live out Pro Humanitate,” Earley explained. So she applied, interviewed and received a job offer that November, before graduation. Now a human capital analyst at Deloitte in Washington, D.C., Earley recommends the program to other students, whole-heartedly.